Anyone in your family being raised learning more than one language? 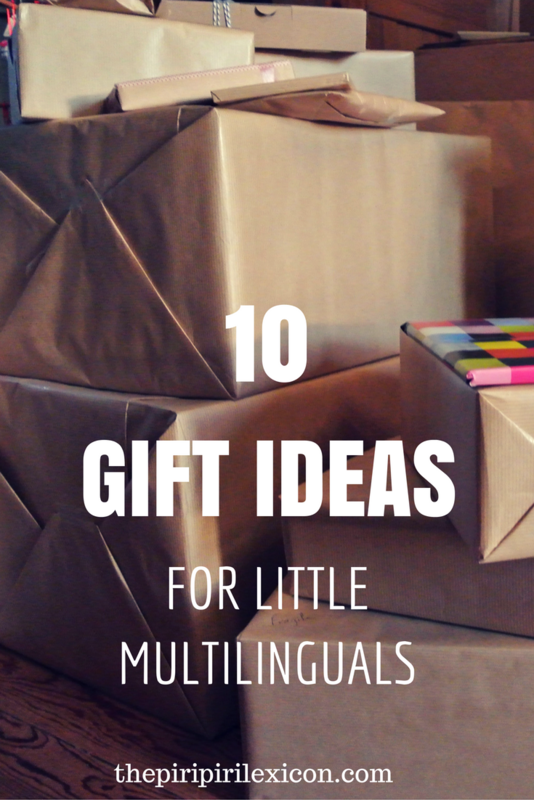 Maybe you would like to send something to someone abroad who speaks a different language? Most gift guides out there are language-specific (e.g. for little learners of Spanish) or for adults language learners. 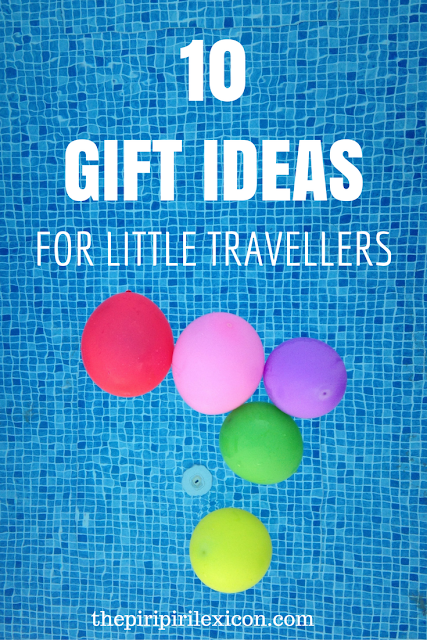 I struggled finding general gift guides that could be suitable for all/most children being raised with more than one language. With this in mind, I have scoured some of my favourite shops and come up with some money-can't-buy options also. I hope there is something for everyone. (Simply click on the images to be taken to the links/products). How about a beautiful poster or image to put on their wall? If you scour Etsy, I am sure you will find some clever ones. Yet, it is tough finding some in languages other than English or bilingual ones. Some of my favourite ones include Frau Otilie for German materials or Children Inspire Design for English and a few other languages or these for Arabic. But my current absolute favourite are these bilingual posters. It is not everyday that you find bilingual materials from Love Your Lingo. Check out the adventure poster, in particular, that you can customise to your choice of languages. 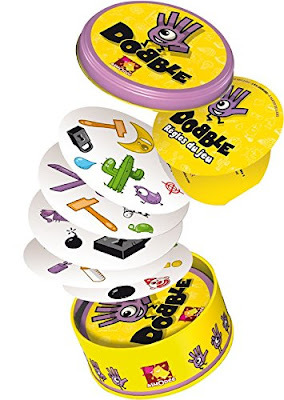 We got given this game (Dobble/Spot It) when our oldest was 5. There are different versions of it (Junior, Sports, etc). The aim of the game it to name something that matches your own card. So you have to think of the name of objects really quickly. It is a great language game to practice vocabulary. And it is great fun. How about getting that little multilingual in your life a penpal? If they are old enough to read and write (or are just beginning), this might be a great option. Find another friend in a different country within a similar age range and who speaks one of the child's minority language(s). And you never know, lifelong friendship might blossom too. 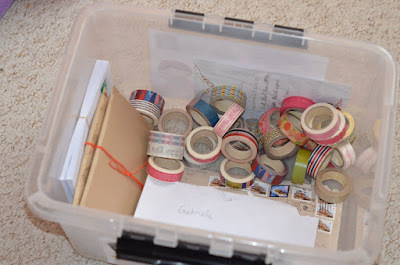 If you really want to add something material to the gift, how about a cute little penpal kit like this one? This is an absolute must in my books. Parents often struggle to find decent quality books in minority languages. So if you are a friend, family from afar or have access to those minority language materials, parents will forever be grateful. Here is a non-exhaustive list of online stores that usually ship worldwide and focus on language books and materials. For a present that lasts throughout the year, what about a subscription to a magazine in a minority language? Many magazines will ship abroad. 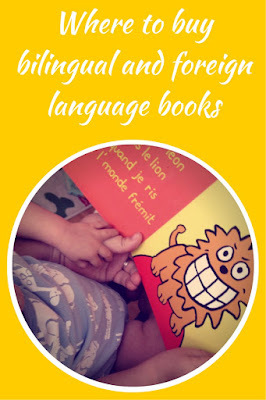 Here are some suggestions for foreign language learning for older children. Also, Bayard do some decent ones in French for all ages. A bilingual one (Spanish, English) for little kids can be found here. National Geographic also has versions in many languages. If your bilingual child does not read yet in every language he has at his/her disposal, audio books may be a great solution. They are also a lot less daunting as they can be played in the background while doing another activity. Passive learning at work. I am not normally a fan of toys that talk or that make noise. But I make rare exceptions for one or two quality toys in minority languages. 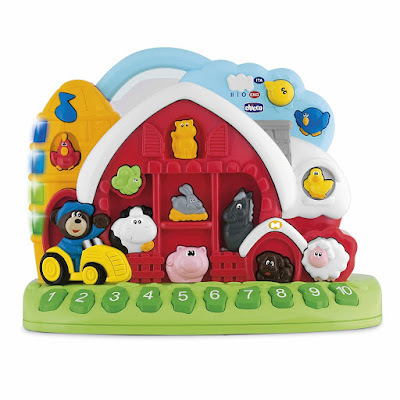 We have an older version of this farm toy from Chicco. It is great for counting, learning colours and animal names and sounds. Even the 6yo still likes to press the buttons once in a while to repeat the words in Portuguese. And it exists in many different language combinations. Check the Amazon sites of other countries to see different language combinations. I am not going to tell you how to subscribe to Netflix in a country that is not yours (ahem), but there are certainly lots of films and cartoons available online these days that are watchable in different languages. Or what about simply a few DVDs of their favourite cartoon in another language than the one they are used to? 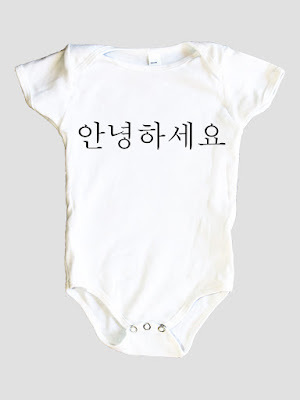 A fun customised t-shirt or top of some sort with words in another language always make people talk and comment. I found these cute ones from Mixed Up Clothing. Or ask Michelle at Mother Tongues. 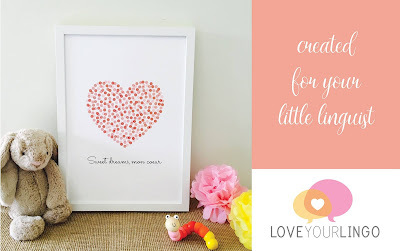 She has some children designs available too and the words printed are very special. 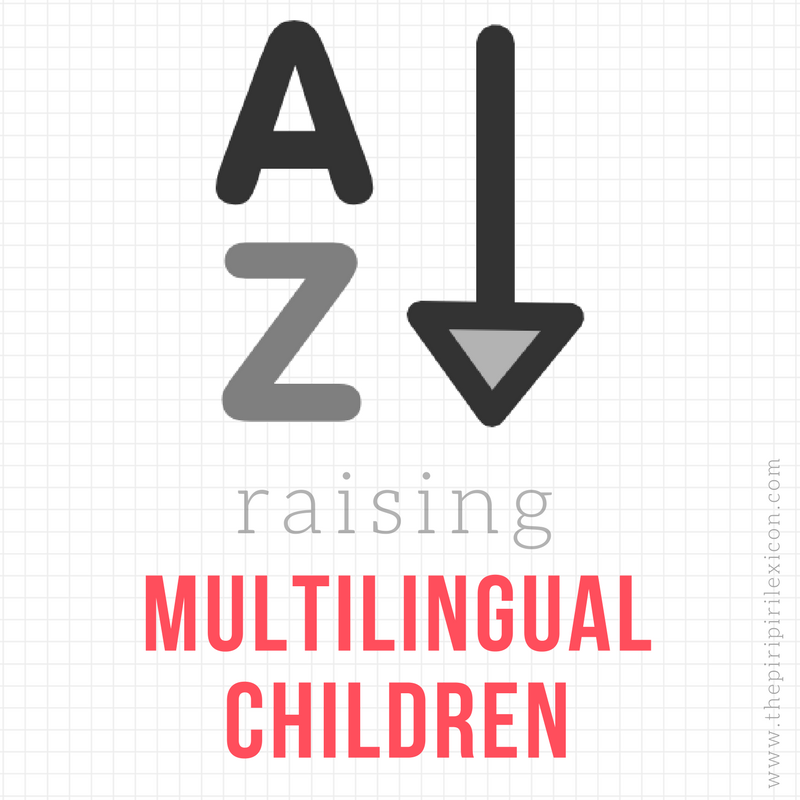 Finally, growing up multilingual is not just about learning a language. it is also about learning about the culture(s) associated with the language in all its aspects. So think outside the box. What about a recipe book from said country? A music album? A game that kids there play but is difficult to find elsewhere? A typical piece of clothing? Something that will spark their interest and that will make them special because nobody around them has the same. Because being multilingual is about celebrating diversity. If you are looking for more ideas, have a look at Bilingual Kidspot. 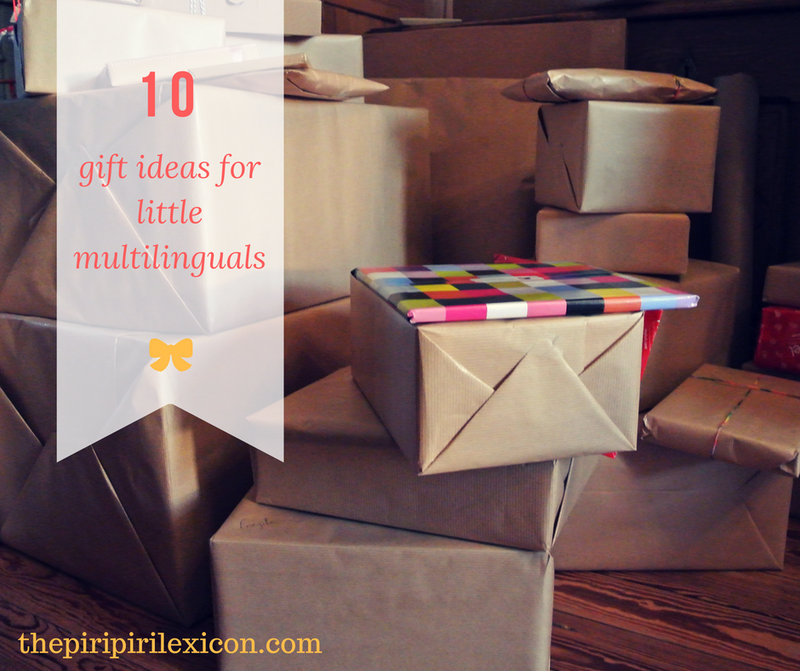 There are some other excellent gift ideas for bilingual children. Did you see my other gift guide? To shop in the UK, click here. In France, click here. Thank you! Just ordered the Dobble. Love the idea of games where everyone in our multi-lingual family can gather round the table and play. Sometimes, the winner wins only because their language matches the game played! Happy Christmas! This is a wonderful way to play.